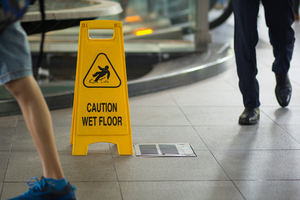 Accidental injury due to a slip and fall is something that is so disconcerting, that no one stops to think on the reason as to why they fell. Sometimes it can be because of a misstep, or a careless move. What most people don’t realize is that sometimes the blame may not be on you, but on the establishment that has created the unsafe environment. It’s important to be vigilant and take a moment to ensure that the fall was your own fault, and not caused by a careless employee, or the unsafe condition of a decrepit staircase. North Bay Village has been around since the 1940s, and it is not inconceivable that some of the buildings that still populate the area are not exactly up to modern standards. At Wolfson Law Firm it is important to us that you get the information you need to ensure that accident you just had was just that, an accident. Our North Bay Village slip and fall attorneys have been consulting and serving people since 1963 and you can phone them at (305) 285-1115 comes at no cost to you. If you should have a viable reason to make a case, they’ll inform you immediately of your options, and the opportunities available to you. The average person does not understand the minutia involved in determining if an accident they've just gone through is enough to be turned over to a court. That is why Wolfson Law Firm is more than prepared to sit down with you to decide if such steps are necessary. Our lawyer’s years of serving clients helps them zero in on the responsible party, be it the establishment that you fell in, or the insurance companies that the establishment is insured with. Every case is different but waiting until long after your injury and pain is only going to lessen the money that is owed to you. Contacting Wolfson Law Firm and ensuring that they’re on the case can help you understand the process and have faith in the system. Our attorneys look at each case as if it will inevitably be taken to trial, which will show the other party that we are serious in representing you and ensuring that you have the opportunity to recover what you deserve. All citizens of North Bay Village are more than welcome to the information we have available, be they in an accident or not, it’s important that you’re versed in at least some of the information so that you have the forethought to know if you need to pick up the phone. These other articles have also shown to provide great information for would-be clients. North Bay Village convenience store injuries. Wolfson Law Firm has several personal injury attorneys in Miami that are more than prepared to fight for you. The managing attorney Jonah Wolfson is a bilingual personal injury lawyer that has been in practice and is ready and willing to help. He and his team are only a phone call away at (305) 285-1115. Do not hesitate and see if your case is solid enough for you to get the compensation that you deserve.